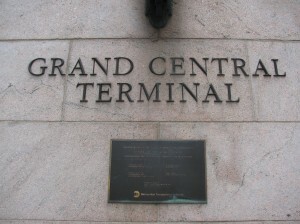 Grand Central Terminal, right next to the Hyatt where Thrillerfest was held. 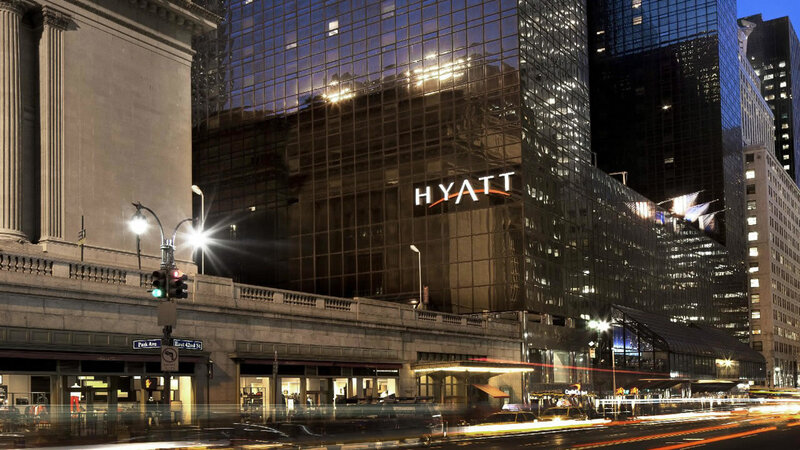 Today’s good news is that the Hyatt (Manhattan) in New York City attached to Grand Central Station (Hyatt Grand Central) that Donald Trump bought when it was the Commodore and revamped is being bought and torn down. Yay! This has to be one of the worst Hyatts, (if not one of the worst hotels in general), that I’ve ever had the misfortune to stay in, not once but at least three times at International Thriller Writers’ Conferences. The first time I stayed at this Hyatt I could not figure out how to turn the lights off in my room. The rooms don’t have normal light switches. They have strange little electrical plates that don’t work. The men sent up by the desk couldn’t get them to work, either. I ended up having to put a pillow over my head and trying to sleep with the lights on for three days. 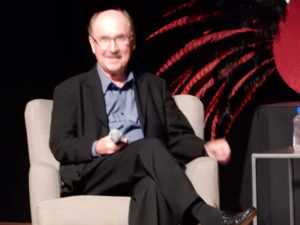 David Morrell, an ITW staple. Secondly, I like bath tubs. I was on a ridiculously high Hyatt floor and there was no water pressure AND no hot water when I tried to hop in the tub and wash my hair quickly. My flight from Chicago had been delayed an entire day; I was lucky to be able to make it in time to “pitch” my novel “The Color of Evil” to a variety of folk. The only person I chose to “pitch” it to was Tony Eldridge, because I knew Tony, personally (slightly). We compared horror stories of our travels. Tony had been stuck on a train, as I recall, traveling from Malibu to New York City, and that had not gone well, either. The worst thing that happened to me while staying at the Grand Hyatt (aside from the sleeping with the pillow over my head thing) was when I wandered out to get some ice or a can of diet soda. I managed to get my hand (actually, my finger) stuck in a decorative wall plaque that I thought was the “door” to a recessed vending machine. (Hint: it wasn’t). I literally was to the point that images of James Franco amputating his own arm when stuck in a canyon in “24 Hours” were dancing in my brain, as I could not get the ring finger on my right hand back OUT of the crevice on the right after I stuck it IN the crevice, thinking that it would swing open somehow. IN reality, this was a gigantic recessed wall thing-ie meant to be decorative, set near the elevator doors where you would expect ice and soda machines to be located. It hurt like a SOB when I (finally) managed to force my finger back out of the tight spot, most of the skin cleverly removed by the incident. The last time I stayed at the Grand Hyatt, while attending the workshop presented by the Bureau of Alcohol, Firearms and Tobacco enforcement officers, I actually asked the woman in charge if there wasn’t ANY other hotel that we could have this conference at besides one that was famous as Trump’s first real estate venture in the eighties. The hotel had no cafeteria or cafe (you had to walk over to Grand Central Station’s food court through a tunnel) and the bar was the most ridiculously overpriced bar in Manhattan. I noticed on the third trip to this hotel that literally none of the “famous” authors who had frequented that bar my first year of attendance (Jon Land, Heather Graham, David Morrell, the “Game of Thrones” guy who was there the last two years, etc.) were hanging out in the bar any more. I’m sure they were able to find a much more reasonably priced bar in the area, and one with adequate seating. Last, but not least, the day I was leaving I had to kill several hours until my plane departed. I checked out by 11 a.m., as required, and left my bags at the desk. Most hotels will happily store your bags for a few hours, but not the Grand Hyatt. There was an hourly charge, per bag, to store your bags in their storage room, despite the fact that you had just paid an outrageous amount to stay in their facility for several days. They can’t tear it down fast enough to suit me. From what I have read, the number of rooms available will decline from something like 1300 to 500, so, hopefully International Thriller Writers will find a different venue for the annual conference—hopefully one that has a coffee shop and a bar that is conducive to friends and fellow authors gathering in the hotel, rather than having to leave and go elsewhere to be seated and/or to be able to afford the ridiculously overpriced drinks. Not my favorite Hyatt, and with the Trump history, truly a hotel worthy of tearing down. Did I mention that they charged you an outrageous amount to use the Internet in the room? If you wanted free Internet, you had to go to the lobby. While I realize that is not that uncommon with high-priced hotels, it did nothing to endear me to the place, since I had no hot water, couldn’t turn my lights off (yes, I called downstairs and the desk told me that they had problems of the sort in the hotel all the time before sending someone up who couldn’t fix it) all night, and found the entire place cold, sterile and uninviting.